As we touched down on the paved runway, surrounded by red clay and grassland, I knew that my journey was about to begin. We were brought to the clinic that we would be working at for the next 2 weeks. The bunkhouse was just across the walkway from where the clinic is situated. 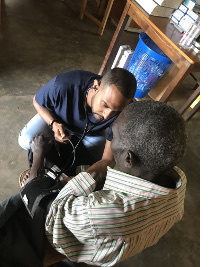 I was able to administer care to a population in need, in a setting that had very little resources. My clinical skills and clinical intuition were attributes that I knew were not only going to serve me well, but also skills that I would hone as well. With each patient that walked through the the door, the array of pathology was unpredictable. I was in awe of some of the pathology that I know would not be seen in the states. I diagnosed a child with rheumatic fever. He was seen by a previous hospital and despite the boy not being sexually actively, was treated for presumed gonococcal septic arthritis. When the problem continued to progress, the father was prompted to bring him to the clinic. After gathering a thorough history as well as performing a diligent physical, he met the criteria for rheumatic heart disease. I follow him the next week on his return with appropriate testing from the next town over. He was placed on appropriate therapy. My heart was truly touched by just how thankful his father was to us for treating his son. This was a truly life changing experience that truly pulled the curtain back to not only the medical conditions, but the socioeconomic conditions that some people live in. I will continue to go back and help in whatever way I can with medical missions in the future.